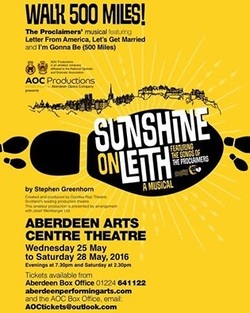 In May 2016, AOC Productions was proud to sell out their 5 show run of Sunshine on Leith at ACT Aberdeen. The show imaginatively weaves the legendary songs of The Proclaimers into a story that follows the highs and lows of soldiers Ally and Davy as they return home to Leith from the army. Families, friendships and the future – not always straight forward in this funny and moving story about love and life. AOC Productions stamped their own footprint on this vibrant, energetic and topical piece of musical theatre. A journey that took in hits such as I'm Gonna Be (500 Miles), Letter From America and I'm On My Way. Sunshine on Leith was originally produced by Dundee Repertory Theatre, the show won the TMA Award for Best Musical in 2007.